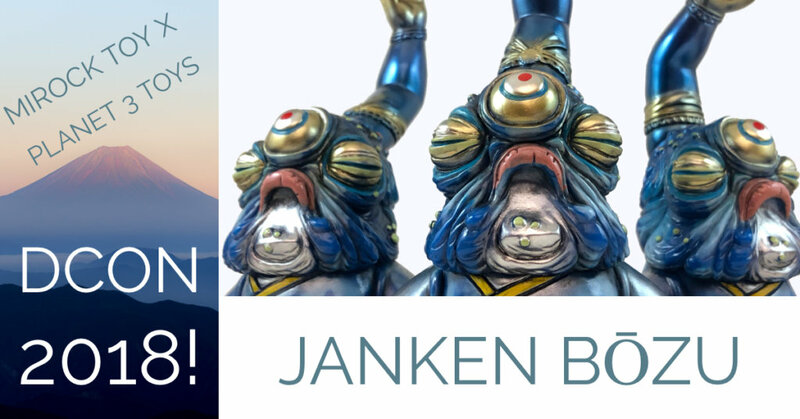 We’re psyched to announce JANKEN BŌZU by Mirock Toy X Planet 3 Toys! You’ve met Bōzu in many forms – shown below is an Instagram post from Planet 3 that shows a few of their Bōzu variations- but now Bōzu is back and coming to California, USA!!! Janken Bōzu, the Designer Con 2018 colorway, stands at approx. 17cm (6.7 inches) and is cast in dark blue/light blue marbled sofubi and painted and modified by Yohei Kaneko (Mirock Toy). Kaneko’s work is known for its stunning attention to detail and beautiful colors on sick sofubi pieces and we couldn’t be happier to see another masterpiece available in the US! This amazing Bōzu comes in 3 versions and stock is limited! At only $80 USD, this is a wonderful find in Designer Con. If you’re interested in finding more amazing pieces from Planet 3 Toys, head over to their Instagram!